Today Mr. Maven and I celebrate our 39th wedding anniversary. 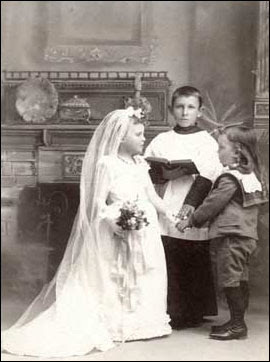 As you can see from our photograph we were just children when we got married. My husband, the romantic, greeted me this morning with, "Happy Anniversary! Thirty-nine years! It seems like thirty-nine minutes . . . underwater." How I love this man! The proposal was equally romantic. "I'm going to tell you something you're not going to like it. I love you and I want to marry you." How could I resist that? When I was young and unmarried my sister labeled me a serial dater. I could not image being with the same man for thirty-nine days much less thirty-nine years. And some of those I dated didn't get thirty-nine minutes. My husband and I met in a car pool that took us to work at the Naval Air Station North Island in San Diego. It seems I was the only member of the five person car pool who didn't know that Mr. Maven drove two hours out of his way every day just to ride in that car pool with me. Mr. Maven and I started our relationship as friends. Eventually, I realized that while I could live without him, I didn't want to. We are still friends and while I don't want to live without him, I've come to realize I can't live without him. We were married in a Wedding Chapel in Arizona by a magistrate named Ersel Byrd. The sign in front of the Chapel read, Byrd's the Word. On our twentieth wedding anniversary we called Ersel to thank him. "How long has it been," he asked. "Twenty years," we answered. "Wait a moment," he said. "I have to get my book. I mark down all of my couples that have made it in my book." When he came back on the phone he said, "I remember you two, my wife and I knew that day you'd make it." It's official. It's in the book. Yes, we've made it and then some. How could I have been so smart as to marry this man; the perfect man for me? I don't know, but thank God I did. Happy Anniversary Mr. Maven! I love you more. Congrats, Mr. & Mrs. Maven! What a lovely story (and photo). Here's to at least 39 more years! HAPPY Anniversary Mr. & Mrs. Maven. THANKS for sharing the car-pooling story. Seems his 2-hour daily investment each day paid off. Love to you both! Great stories. Thank you for a peek into your real life. Methinks that Mr. Maven is one lucky guy. A keeper, you are! I wish you 39 more (after all, you were just kids then, right?)!!! Happy Anniversary! Enjoyed your story and love the photo! Congratulations to you both. Will you bring Mr. Maven to Jamboree? I'm looking forward to meeting the famous fM! Thank you all for your well wishes! Mr. Maven is really the reason this marriage works. I will admit that I'm extremely difficult to live with. We are off to spend the day together and then dinner out with friends. Kathryn - no Mr. Maven tries not to venture into California. I think it has something to do with watching me spend money. I am trying to arrive a few days early to visit the archives at MGM and search for my elusive Grandfather. Looking forward to meeting you and all those other people I've come to know and love. Congratulations on 39 years of marriage. I wish you many more happy years together. Congrats on those 39 happy years!! Allow me to add my congratulations! Thirty-nine years is a wonderful milestone. BTW, I need to borrow that photo to use on our fortieth, which is later this year. I was just a child, too! What a great story! Thanks for sharing it. My husband and I have not yet reached such an inspiring milestone, but our respective parents both had their 40th anniversaries last year, and it's a wonderful thing to celebrate. Enjoy the day, and congratulations! Thank you for sharing your wonderful story. My sincere congratulations to you both. I love that you found everlasting love in my hometown. Very romantic. I wish you many more wonderful years together. Congratulation and thank-you so much for the story. I absolutely love the picture - you always have just the right photos for your stories. Happy Anniversary to you both! Hope you have a wonderful day and evening! What a milestone! Love the picture and the story! Congratulations! Congratulations fM and Mr. fM! Many more years to both of you! A slightly belated "Happy Anniversary" to Mr. and Mrs. fM. LUVED the story! My Hubbie and I are now in our 34th year of marriage -- seems like only yesterday, doesn't it?!? I'm at 37 years and it sounds like Mr. Maven is a lot like Mr. Frazel. That's a great story. Thank you to everyone for stopping by and wishing us a Happy Anniversary. We took the whole weekend and spent it together. We had too much to eat and spent much of the time laughing. Yes, it seems like only yesterday. Time passes so quickly! Diana, always having the perfect photo is really the only bone of contention in this marriage. Mr. Maven is getting tired of bumping into them! Told him - simple solution, need a room just for photographs! He's not falling for it. Well, I'm late as usual, but please let me add my pozdravleniya - congratulations. And I love the part about Ersel Byrd - he sounds like our Dr. Maiden. I must have been "Computerless in Boston" when this story broke... Belated congrats and best wishes to you both.